THIS DECLARATION OF COVENANTS AND RESTRICTIONS ("this Declaration") made this 7th day of June, 1994, by ISLAND LAKE ASSOCIATES, a Michigan general partnership (the "Declarant"), having its principal office at 21790 Coolidge Highway, Oak Park, MI 48237. (A) Declarant is the owner in fee simple absolute of certain real property (the "Subdivision") situated in the Charter Township of Canton (the "Township"), Wayne County, Michigan. The Subdivision is more particularly described on Exhibit "A" attached hereto. (B) The Subdivision consists of (i) 263 lots (the "Lots") each of which is to be used for the construction and occupancy of one (1) detached single-family residence and permitted related improvements, in each case, subject to (a) the provisions of this Declaration; (b) the provisions of the Declaration of Reciprocal Roadway Easement, dated March 8, 1993 (the "Reciprocal Roadway Easement"), recorded in liber 26390, page 818, Wayne County Records; (c) the Agreement for Planned Development District, dated March 8, 1993, together with the related Notice and Affidavit of Planned Development District, dated March 8, 1993, and recorded in liber 26390, page 800, Wayne County Records; (d) the Agreement for Maintenance of Storm Drainage Facilities, dated February 24, 1994 (the "Storm Drainage Facilities Agreement"); (e) easements and rights-of-way, and other matters, of record; and (f) applicable statutes and ordinances, and rules and regulations, of the Township, the County of Wayne, and the State of Michigan; (ii) private parks (the "Common Areas"), for the benefit of the Subdivision, and intended for the use, in common, of (a) the Owners of each Lot (the "Owners"); (b) the Occupants; and (c) the Permittees; and (iii) private roadways (the "Roadways"), for the benefit of the Subdivision, and intended for the Permittees, for vehicular and pedestrian ingress, egress, travel and passage (including, without limitations, travel by golf cart within the designated Golf Cart Crossing areas), to and from each Lot, and to and from adjacent public streets and golf course facilities, and for aesthetic purposes in connection with the Lots (the "Permitted Purposes"). The Roadways will not be under the jurisdiction of the County of Wayne, State of Michigan ("Wayne County"), and, accordingly, will not be maintained, repaired or replaced by Wayne County. (C) Sections of the Subdivision, including, without limitation, the Roadways within such sections, will be traversed by, or be adjacent to, a golf course (the "Golf Course"), including, without limitation, the golf cart paths appurtenant thereto, to be developed, owned and operated by (or under) the Township, and to be known as "Pheasant Run". The Golf Course is not part of the Subdivision. (D) Declarant desires to subject the Subdivision to the covenants, restrictions, conditions, easements, charges and liens hereinafter set ford (i) to insure the development of the Subdivision as a desirable residential community; (ii) to prevent the construction, installation, placement or maintenance of any undesirable use, improvement or thing within the Subdivision; (iii) to promote internal harmony within the Subdivision; (iv) to provide for the perpetual preservation and maintenance of the Common Areas and Roadways within the Subdivision in a manner consistent with high environmental, aesthetic and residential standards; (v) to provide for the perpetual preservation and maintenance of the Storm Drainage Facilities, in accordance with the Storm Drainage Facilities Agreement; and (vi) to provide for the payment by the Owners of all of the costs and expenses in regard to the administration, operation, maintenance, repair and replacement of the Common Areas, Roadways and Storm Drainage Facilities, as described in this Declaration, the Reciprocal Roadway Easement, and the Storm Drainage Facilities Agreement. (E) The areas occupied by the Roadways (the "Roadway Areas") are named in the recorded Plat of the Subdivision, and are particularly described in the Reciprocal Roadway Easement. (F) The Roadway Areas are (or may be) subject to additional easements and licenses (the "Underlying Roadway Easements"), granted, or to be granted, by Declarant, or the Association, in favor of the Township, and others, for service and emergency purposes of every kind and description, for utility systems serving the Subdivision (the "Common Utility Systems"), including, without limitation, sanitary sewage disposal, water supply, storm drainage outlet, domestic electric, natural gas, telephone and cable television facilities and purposes, and for separate connections to such Common Utility Systems for the benefit of each lot. (G) Declarant deems it desirable to create an entity (the "Association") to own and/or maintain the Common Areas and Roadways, and to which shall be delegated and assigned certain powers and duties hereunder, including, without limitation (i) the administration, operation, maintenance, repair and replacement of the several elements comprising the Common Areas; (ii) the maintenance, repair and replacement of the several elements comprising the Storm Drainage Facilities; (iii) the administration, operation, maintenance, repair and replacement of the several elements comprising the Roadways, including, without limitation (a) the paved driving surface within the Roadways (the "Wearing Surface"), which reference includes the related curbs and gutters; (b) the landscaped and planted areas within the Roadways (the "Landscaped Areas" which reference includes any irrigation system serving such areas); (c) the entrance monuments, decorative walls and gates, and other architectural features within, or adjacent to, the Roadways (the "Entrance Monuments"); (d) the street and other lighting facilities within the Roadways (the "Lighting Facilities"); (e) the traffic control and other signage within the Roadways (the "Signs"); and (f) the golf cart crossing areas within the Roadways (the "Golf Cart Crossings"), which reference includes the decorative designated crossing areas within the Wearing Surface, the appurtenant signage, including, without limitation, decorative mandatory stop signs and speed bumps on either side of each such designated crossing area, and the landscaping of the golf cart paths on either side of each such crossing, the full width of such crossing, to the depth of the adjacent Lots; (iv) the enforcement of the covenants, restrictions, conditions, easements, charges and liens set forth in this Declaration; (v) the collection and disbursement of the assessments and charges described in this Declaration; (vi) the promotion of the health, safety and welfare of the residence of the Subdivision; (vii) the enforcement of the Reciprocal Roadway Easement; (viii) the enforcement of the Storm Drainage Facilities Agreement; and (ix) the enforcement of the Underlying Roadway Easements. (H) Declarant has caused the Association to be organized as a nonprofit corporation (with mandatory assessment powers), for a perpetual term, under the laws of the State of Michigan, for the purpose of exercising the powers, duties and functions of the Association set forth in this Declaration (either directly, or through a management agent and/or maintenance contractors engaged by the Association, or through an association in which the Association is a constituent member). NOW, THEREFORE, Declarant hereby declares that the Subdivision, including each Lot, Common Area and Roadway in the Subdivision, shall be held, transferred, sold, conveyed, leased, used and occupied subject to the following covenants, restrictions, conditions, easements, charges and liens, each of which is for the benefit of, and shall run with and bind, each Lot, Common Area and Roadway, and each Person having any right, title or interest in any Lot, Common Area and Roadway, including, without limitation, each Owner and Occupant, and/or the heirs, personal representatives, successors and/or assigns of any such Person. 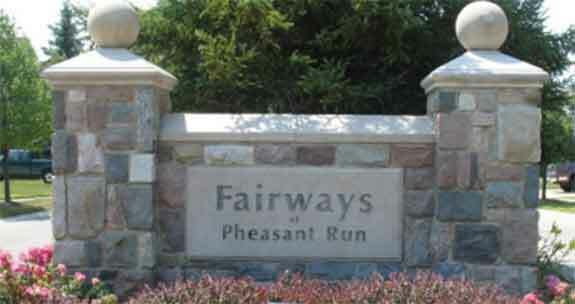 "Association" shall mean and refer to the Fairways at Pheasant Run Association, Inc., A Michigan nonprofit corporation, whose principal office is presently located at 21790 Coolidge Highway, Oak Park, Michigan 48237, and any successor thereto. "Committee" shall mean and refer to the Architectural Review Committee established under the provisions of this Declaration, or the Association, as the context may require. "Common Areas" shall mean and refer to those areas of land denoted as "Private Parks" on the recorded Plat of the Subdivision, and intended to be (i) owned by the Association, and (ii) devoted to the common use and enjoyment of the residents in the Subdivision, together with any and all improvements now or hereafter located thereon. "Declarant" shall mean and refer to Island Lake Associates, a Michigan general partnership, or any successor thereto, or any Person to whom or which it may expressly assign any one or more of its rights, or delegate any of its authority hereunder, in each case by means of an appropriate document recorded with the Register of Deeds of Wayne County, Michigan, and, in each case, as the context may require. "Improvement" shall mean and refer to every building of any kind, garage, shed, gazebo, fence, wall or gate, pool, tennis court, or other structure or recreational facility which may be erected or placed on any Lot, including, without limitation, any driveway, parking area, landscaping, plated material, sign, statue, exterior ornament, drainage system and/or utility connection thereon or therein. "Lot" shall mean and refer to any numbered parcel of land shown as such upon the recorded Plat of the Subdivision, and used or to be used for the construction and occupancy thereon of a detached single-family residential dwelling, and related improvements, in accordance herewith, and such reference may include such dwelling and related improvements, as the context may require. "Members" shall mean and refer to all those Persons entitled to membership in the Association, as provided in this Declaration. "Occupant" shall mean and refer to any Person, holding under an Owner, and entitled by lease, deed, contract or other agreement to use and occupy a residence upon any Lot. "Owner" shall mean and refer to the record owner, whether one or more Persons, of the fee simple title to any Lot, including, for such purpose, the land contract vendee in regard to any Lot (rather than the land contract vendor), but not including any mortgages unless and until such mortgages shall have acquired such fee simple title pursuant to foreclosure, or any proceeding or conveyance in lieu of foreclosure. Where more than one Person has an interest in the fee simple title to any Lot, the interests of all such Persons collectively shall be that of a single Owner for purposes of voting on all matters involving the Association and Subdivision. "Permittee" shall mean and refer to the visitors, invitees and guests of each Owner and Occupant, together with police and fire department, school district and other local governmental employees, and United States Postal Service personnel, tradesmen, suppliers and contractors performing services within the Subdivision, or making deliveries to any Lot, and other Persons entitled to use the Roadways under the terms and provisions of the Reciprocal Roadway Easement, together, in each instance, with the vehicle(s) and equipment of each such Person. "Person" shall mean and refer to any corporation, partnership, trust, association or natural person, or combination thereof, as the context may require. "Roadway" shall mean and refer to any one or more, or all, of the improvements now or hereafter installed or located within any Roadway Area, including, without limitation (i) the Wearing Surface; (ii) the Landscaped Areas; (iii) the Entrance Monuments; (iv) the Lighting Facilities; (v) the Signs: (vi) the Golf Cart Crossings; (vii) the Common Utility Systems; and/or (viii) replacements of any of the foregoing, or of parts thereof, as the context may require. "Roadway Area" shall mean and refer to each named area occupied by a Roadway, as more particularly depicted on the recorded Plat of the Subdivision, and as more particularly described in the Reciprocal Roadway Easement. "Storm Drainage Facilities" shall mean and refer to certain storm water collection and outlet facilities, serving the Subdivision, located upon certain property adjacent to the Subdivision, owned by the Township, and described in the Storm Drainage Facilities Agreement, including (i) certain storm water detention basins, and (ii) certain storm sewer lines. "Township" shall mean and refer to the Charter Township of Canton, Wayne County, Michigan. SECTION 1. MEMBERSHIP. Every Person who or which is the Owner of a Lot shall be a Member of the Association. Membership in the Association is, and shall be, appurtenant to, and may not be separated from, ownership of any Lot. Notwithstanding the foregoing, the termination of any Person's ownership interest in any Lot, and the consequent termination of such Person's membership in the Association, shall not be deemed to relieve such Person from any debt or obligation attributable to such Lot which accrued or arose during the period in which such Person was an Owner of a Lot. (e) At such time as 200 Lots shall have occupied residences on them, or at such earlier time as shall have been designated in writing by the Declarant, Class B Members of the Association shall have the voting rights described in subsection (d) above, and, thereafter, the Board shall be elected by the combined vote of the Class A and Class B Members (in each case, voting on a one vote per Lot basis). SECTION 1. MEMBERS' EASEMENTS OF ENJOYMENT. Subject to the provisions of Section 3 of this Article IV, following, and the provisions of the Reciprocal Roadway Easement, every Member shall have a right and easement of enjoyment in and to the Common Areas and the Roadways, and such easements shall be appurtenant to and shall pass with the title to any Lot whether or not specifically set forth in the deed or other conveyance to such Lot. SECTION 2. TITLE TO COMMON AREAS AND ROADWAYS. Declarant hereby covenants that it shall convey the Common Areas and Roadways to the Association, free and clear of all liens and encumbrances, except (i) easements and rights-of-way of record, and (ii) such rights with regard to the grant of additional easements as are reserved to the Declarant and/or Association herein, and subject to the Members' rights and easements of enjoyment, not later than three years from the date of recordation of this Declaration. (e) the right of the Association to levy assessments upon the Lots, as set forth in Article V hereof. SECTION 4. DELEGATION OF USE. Any Owner may delegate his right of enjoyment in and to the Common Areas and Roadways to the members of his family and/or his Occupants and Permittees. SECTION 5. ADDITIONAL EASEMENTS. Declarant reserves the right to grant additional easements affecting the Common Areas, or Roadways, to government agencies, and others, for utilities of any kind serving the Subdivision, or any part thereof, without the consent of the Association or any Member. SECTION 6. UNIFORM APPLICATION. This Declaration and the Reciprocal Roadway Easement apply uniformly to each Lot. Every Person who or which is the Owner of a Lot shall be a Member of the Association. Membership in the Association by each Owner is a mandatory condition of Lot ownership, and is appurtenant to, and may not be separated from, ownership of any Lot. Each Members has equal rights in the Common Areas and Roadways. SECTION 1. CREATION OF THE LIEN AND PERSONAL OBLIGATION OF ASSESSMENTS. The Declarant, for each Lot within the Subdivision owned by Declarant, hereby covenants and agrees, and each Owner of any Lot, by acceptance of a deed, land contract or other conveyance thereto, whether or not it shall be so expressed in any such deed, land contract or other conveyance, shall be deemed to have covenanted and agreed to pay to the Association, annual and special assessments and/or charges, established and to be collected as hereinafter provided. Such assessments, together with interest thereon, administrative fees, and the costs of collection thereof, including reasonable attorneys' fees, shall be a charge and continuing lien upon the Lot against which each such assessment is made. Each such assessment, together with interest thereon, administrative fees, and the costs of collection thereof, including reasonable attorneys' fees, shall also be the personal obligation of each Person who was an Owner of such Lot at the time the assessment becomes due a payable. The personal obligation of any Owner for any delinquent assessment shall not pass to any successor in title of such Owner unless expressly assumed by such successor. SECTION 2. PURPOSE OF ASSESSMENTS. The assessments levied by the Association shall be used exclusively to promote the health, safety, and welfare of the residents in the Subdivision, and, in particular, for (i) the operation, maintenance, management and improvement of the Common Areas and Roadways, including, without limitation, the repair and replacement thereof, and the costs of labor, material, equipment and supervision; (ii) the periodic plowing of snow within the Roadway Areas; (iii) the installation of additional facilities, improvements and landscaping within the Common Areas and Roadways; (iv) the operation and maintenance of the Storm Drainage Facilities, to the extent described in the Storm Drainage Facilities Agreement; (v) the payment of real estate taxes in regard to the Common Areas and Roadways; (vi) the payment of insurance expenses in regard to the Common Areas, the Roadways, and the Association; (vii) enforcing the provisions of this Declaration, the Reciprocal Roadway Easement, the Storm Drainage Facilities Agreement, and any Underlying Roadway Easement; (viii) providing community services; and (ix) the protection of the Owners. (a) until January 1st of the year immediately following the conveyance of the first Lot to an Owner other than the Declarant, the maximum annual assessment shall be Three Hundred ($300.00) Dollars per Lot. (d) the Board may, after consideration of the current fiscal needs of the Association, fix the actual annual assessment for any year at an amount less than the maximum herein otherwise permitted. SECTION 4. SPECIAL ASSESSMENTS. In addition to the aforesaid annual assessments, the Association may levy against each Owner, in any assessment year, a special assessment, applicable to that year only, for the purpose of defraying, in whole, or in part, the costs of any construction, reconstruction, repair or replacement of any improvement upon the Common Areas or Roadways, or as required in connection with the operation and maintenance of the Storm Drainage Facilities. SECTION 5. UNIFORM RATE OF ASSESSMENTS. The annual assessments, and each special assessment, shall be set by the Board at a uniform rate for each Lot, and may be collected on an annual basis, or in such installments, as the Board shall deem appropriate. SECTION 6. NOTICE OF QUORUM FOR ACTION AUTHORIZED UNDER SECTIONS 3 AND 4. Written notice of any meeting called for the purpose of taking any action authorized under either Section 3 or 4 of this Article V, shall be sent to all Owners not less than fifteen (15) days in advance of such meeting. At the first meeting so called, the presence at the meeting of Owners, or of proxies, entitle to cast thirty percent (30%) of all votes of the Class A and Class B membership shall constitute a quorum. If the required quorum is not present at such meeting, another meeting may be called, subject to the notice requirement set forth above, and the required quorum at such subsequent meeting shall be one-half (1/2) of the required quorum at the proceeding meeting, provided that such subsequent meeting shall be held not more than sixty (60) days following the preceding meeting at which a quorum was not present. SECTION 7. DATE OF COMMENCEMENT OF ANNUAL ASSESSMENTS: DUE DATE. The annual assessments provided for herein shall commence as to all Lots on the first day of the month next following the conveyance of the first Lot to an Owner other than Declarant. The first annual assessment shall be made for (and adjusted on the basis of) the balance of the calendar year, and shall become due and payable as at the day fixed for commencement. The annual assessment for any year, after the first year, shall become due and payable on the first day of January of such year. SECTION 8. DUTIES OF BOARD OF DIRECTORS. Subject to the limitations set forth in Sections 3, 4, and 6 of this Article V, the Board shall fix the amount of the annual (and any special) assessment against each Lot for each assessment period at least thirty (30) days in advance of such date or period, and shall, at that time, prepare a roster of the Lots and the assessments applicable thereto, which shall be kept in the office of the Association and shall be open to inspection by any Owner. Written notice of the assessment shall thereupon be sent to every Owner subject thereto; provided, that any failure by the Association to send any such written notice to any Owner on a timely basis shall not permit such Owner to avoid payment of such assessment, provided that a notice of assessment is eventually sent to such Owner. The Association shall, upon demand, and payment of a reasonable charge, furnish to any Owner liable for such assessment a certificate in writing signed by an officer of the Association setting forth whether such assessment has been paid. Such certificate shall be conclusive evidence of payment of any assessment therein stated to have been paid. SECTION 9. EFFECT OF NON-PAYMENT OF ASSESSMENT: THE PERSONAL OBLIGATION OF THE OWNER: THE LIEN: REMEDIES OF THE ASSOCIATION. Any assessment not paid within thirty days after the due date shall be deemed delinquent, and shall bear interest from the due date at the rate of eleven percent (11%) per annum, and, further, shall be subject to an administrative fee equal to twenty percent (20%) of the amount of the assessment to cover the cost of collection by the Association (collectively, the "Delinquent Assessment"). The Association may bring an action at law against the Owner personally obligated to pay such Delinquent Assessment, or foreclose the lien against the Lot, and there shall be added to the amount of such Delinquent Assessment the cost of preparing and filing the complaint in such action, or in connection with such foreclosure, and in the event a judgment is obtained, such judgment shall include interest on the Delinquent Assessment, as above provided, and a reasonable attorney's fee to be fixed by the court, together with the costs of the action. No Owner may waive or otherwise escape liability for any assessment by non-use of the Common Areas or Roadways, or by the abandonment of such Owner's Lot. Subject to the provisions of Section 10 of this Article V, sale or transfer of any Lot shall not affect the lien for any unpaid assessment regarding such Lot. SECTION 10. SUBORDINATION OF THE LIEN TO MORTGAGES. The lien of the assessment(s) provided for herein is and shall be subordinate to the lien(s) of any mortgage or mortgages now or hereafter placed upon any Lot subject to assessment hereunder; provided, however, that such subordination shall apply only to assessments which have become due and payable prior to sale or transfer of such Lot pursuant to foreclosure of such mortgage(s), or prior to any other proceeding or conveyance in lieu of foreclosure. Such sale, transfer or conveyance shall not, however, relieve such Lot from liability for any assessment thereafter coming due, or from the lien of any such subsequent assessment. SECTION 11. OTHER AFFILIATIONS. Upon the terms, provisions and conditions set forth in the Reciprocal Roadway Easement, the Association will be a constituent member in an association (the "Committee"), consisting of the Association, the Township, and the separate associations formed in connection with two adjacent subdivisions (the "Adjacent Subdivisions"), to operate, maintain, improve, repair and replace the Roadways, and certain similar private roads within the Adjacent Subdivisions and certain property owned by the Township. The Association will be required to pay and/or reimburse the Committee for certain recurring services provided, and expenditures incurred, in connection with the Roadways. SECTION 1. ARCHITECTURAL REVIEW COMMITTEE. No Improvement shall be erected, placed, installed, constructed, reconstructed or maintained on any Lot, nor shall any exterior addition to, or change in, or alteration of the exterior appearance of any Improvement, or any change in landscaping, be made until plans and specifications showing the kind, size, shape, height, colors, materials, topography and location of each Improvement on the Lot shall have been submitted to and approved in writing by the Committee. The Committee shall, initially, be composed of three (3) Persons appointed by Declarant, who need not be Owners, and who may be employees, officers, directors, agents or affiliates of Declarant. Each member of the Committee shall serve until be or she resigns and is replaced by a subsequent appointee. At such time as all of the Lots shall have been sold to Owners other than Declarant, each sitting member of the Committee shall resign, and Declarant shall delegate and assign to the Association its power of appointment with regard to members of the Committee; provided that, Declarant may, at its sole discretion, make such delegation to the Association at an earlier time. Neither Declarant nor any member of the Committee shall have any liability whatsoever to any Person in connection with the approval or disapproval of, or failure to review, any plans or specifications in regard to any Improvement. SECTION 2. PRELIMINARY APPROVAL. Preliminary plans and specifications may be first submitted to the Committee for preliminary approval. (g) any other data, drawings or specifications which the Committee deems necessary to fulfill its function. SECTION 4. VARIANCE REQUIRED. No approval of the Committee shall be valid if any Improvement violates any restriction set forth in this Declaration, or any provision of the Township's zoning ordinance, except in cases where an appropriate waiver or variance in regard to such Improvement has been granted by the Township and/or Committee, as provided in this Declaration. SECTION 5. APPROVAL AND DISAPPROVAL. The Committee may disapprove plans for any Improvement or alteration for non-compliance with any restriction contained in this Declaration, or because of dissatisfaction with the grading and drainage plans, the location of any Improvement on the Lot, the proposed materials, the proposed color scheme, the proposed finish, design, proportion, shape, height, style or appropriateness of the proposed Improvement or alternation, or because of any matter or thing, which, in the judgment and discretion of the Committee, would cause the proposed Improvement or alteration to be inconsistent with the objectives of the Committee, or with improvements erected or to be erected on other Lots, including purely aesthetic considerations. No material change may be made in any approved plan or specification, including, without limitation, any approved exterior material, stain, color, or roof material, or in the approved landscaping plan, without the prior written consent of the Committee. One complete set of the approved plans and specifications in regard to each Lot, including any and all approved amendments thereto, shall be kept and retained by the Committee for its permanent file in connection with each Lot. SECTION 6. FAILURE TO ACT. In the event the Committee shall have failed to approve or disapprove plans and specifications within thirty (30) days after the full, proper and complete submission thereof, the need for such approval by the Committee shall be deemed to have been waived, but all other restrictions, limitations and conditions set forth in this Declaration shall apply and remain in full force and effect as to such plans and specifications. SECTION 7. FORM OF APPROVAL. Committee approval shall be deemed given if the plans and specifications submitted for approval are marked or stamped as having been finally approved by the Committee, and are signed and dated by two (2) members of the Committee validly serving on the date of such approval. SECTION 8. REVIEW FEE. The Committee may charge a review fee, not to exceed Two Hundred Fifty ($250.00) Dollars, in connection with the review of plans and specifications for any Improvement or combination of Improvements on any Lot, or in regard to the substantial alteration of any Improvement. The fee may not be utilized for the purpose of paying any salary to any member of the Committee, but exclusively for the purpose of reimbursing the actual expenses of the Committee, including, without limitation, the professional fees of independent consultants to the Committee. SECTION 1. PERMITTED USE. No Lot shall be used except for single family residential purposes. Except as specifically permitted herein, no structure shall be erected, altered, re-erected, placed or permitted to remain on any Lot other than one single family residential dwelling (the "Dwelling"), not to exceed three (3) stories and 35 feet in height, and a private garage for not more than three (3) vehicles for the sole use of the Owner/Occupant of the Lot upon which such Dwelling shall have been erected, together with such other Improvements as the Committee shall have approved. Each garage shall be attached or architecturally related to the Dwelling to which such garage pertains, and shall be constructed at the time of, and in conjunction with, construction of such Dwelling. No garage shall provide space for less than two (2) vehicles. Except upon the approval of the Committee, garage doors shall not face the Roadway upon which such Lot fronts. Carports are specifically prohibited. No part of any Dwelling or appurtenant structure shall be used for any activity normally conducted as a business. Except as specifically permitted herein, a pre-existing structure may not be moved onto any Lot. Each Dwelling shall otherwise be so oriented on the Lot as to face the Roadway. SECTION 2. MINIMUM FLOOR AREA. The minimum livable floor area of the Dwelling shall not be less than two thousand (2,000) square feet, in the case of a one story Dwelling, nor less than two thousand two hundred (2,200) square feet, in the case of a one and one-half story Dwelling, nor less than two thousand four hundred (2,400) square feet, in the case of a two story Dwelling, nor less than two thousand four hundred (2,400) square feet on the upper two (2) levels, in the case of a tri-level or quad-level Dwelling, in each case, measured from the exterior faces of the exterior walls. As used herein, the term "livable floor area" shall not be deemed to include basements or unfinished attics, or garages, patios, decks, open porches, entrance porches, terraces, storage sheds, breezeways, or like areas, even if attached to the Dwelling, but such term shall be deemed to include enclosed porches if the roof of the porch is an integral part of the roof line of the Dwelling. Each Dwelling shall have a basement. SECTION 3. ALTERATION OF LOT. No Lot may be divided or reduced in size except by the taking of part thereof by a public agency for a public purpose. Whole Lots may be combined for use as one (1) building site. SECTION 4. MINIMUM YARDS. Without a variance granted by the Township, and approved by the Committee, no Dwelling or other structure shall be located on any Lot nearer than 25 feet to the front Lot line, or nearer than 35 feet to the rear Lot line, or nearer than 20 feet to a side street Lot line, in the case of a corner Lot; provided that where a corner Lot shares a common rear yard relationship with the Lot immediately to the rear thereof, and a common side yard relationship with the block directly across the common separating street, a minimum side yard of 5 feet on the street side of such Lot shall be permitted. The minimum distance between a garage door and the nearest side Lot line (except for corner Lots) shall not be less than 22 feet. The minimum distance between a garage door and the side street Lot line, in the case of a corner Lot, shall not be less than 20 feet. Except as above and hereinafter set forth, each Dwelling, or other structure, shall be so located and erected upon the Lot as to provide a minimum side yard on one side thereof no less than 5 feet, and the combined total of the two side yards on such Lot shall not be less than 16 feet. The minimum distance between Dwellings on adjacent Lots shall not be less than 16 feet. SECTION 5. EXTERIOR MATERIALS. The visible exterior walls of each Dwelling and appurtenant structure shall be constructed of brick, brick veneer, wood and/or stone in any combination. Stucco, aluminum siding and/or ledge rock (but not vinyl siding or Texture 1-11) may also be used, so long as any of these materials along, or in combination, do not exceed twenty five percent (25%) of the total of all visible exterior walls. The Committee may grant such exceptions to this restriction as the Committee shall deem desirable, subject to any applicable Township ordinance regarding the use of certain exterior materials. Windows and doors shall not be considered visible exterior walls for purposes of this section. No unpainted (or non-factory painted) metal doors may be used in the exterior of any Dwelling or appurtenant structure. No used material, except reclaimed brick, may be used in the construction of any visible exterior wall. The use of exposed cement block, slag, cinder block, imitation brick, asphalt or any type of commercial siding on any visible exterior wall is expressly prohibited. SECTION 6. SIMILAR ELEVATIONS. No substantially similar front elevation in style and color of any Dwelling shall be duplicated on any Lot less than three hundred (300) feet away long the front Lot lines, unless approved by the Committee. Different colors and building material patterns shall be used for Dwellings on adjacent Lots to avoid the appearance of repetition. SECTION 7. WALLS AND FENCES. No fences or wall of any type shall be permitted for the purpose of enclosing any Lot. Wrought iron fencing (but not fencing of the wire type commonly known as "Cyclone Fencing") may be used on any Lot for the purpose of enclosing a permitted swimming pool, in locations approved by the Committee. The side yards and rear yard (but not the front yard) of any Lot may be enclosed by landscaping pursuant to a plan approved by the Committee, provided that the street side of a corner Lot shall be considered a second front yard for purposes of the foregoing limitations. SECTION 8. SWIMMING POOLS. No swimming pool may be installed on any Lot any portion of which is higher than one (1) foot above the finished grade of the Lot. No above ground swimming pool may be erected, placed or permitted to remain on any Lot, either temporarily or permanently. SECTION 9. ANIMALS. Except as hereinafter set forth, no animals or fowl shall be kept, bred or harbored on any Lot. Not more than two (2) domesticated animals, of a type commonly deemed to be household pets, may be kept on any Lot (but not kept or bred for commercial purposes), as long as each such pet shall have such care and restraint as not to be objectionable or offensive to others due to noise, odor or unsanitary conditions. Any such pet shall be kept either on a leash, or in a run, pen or kennel (in any event, a "pen"), and shall not be allowed to run loose or unattended. No pen shall be erected, placed or permitted to remain on any Lot unless located within the rear yard of such Lot adjacent to a wall of the Dwelling or garage, and facing the rear or interior of the Lot, and such pen shall not be permitted to extend into either side yard. All pens shall be made of wood, decorative block or approved fencing materials, or any combination thereof, and may not exceed three hundred (300) square feet in area or four (4) feet in height. The exterior side of a pen shall be landscaped with plantings to screen the view thereof from adjacent Lots, and such pen shall be kept and maintained in a clean and sanitary condition. The construction and landscaping plans for a pen are subject to approval by the Committee. SECTION 10. TEMPORARY STRUCTURES. No structure of a temporary character, trailer, commercial vehicle, recreation vehicle, shack, garage, barn, storage shed, tent, tree house, or other similar outbuilding, may be used or occupied at any time, on any Lot, either temporarily or permanently, except that (i) tents for entertainment purposes may be erected on any Lot for periods not to exceed forty-eight (48) hours; (ii) an appurtenant swimming pool bathhouse may be maintained on any Lot, provided that the plans for such swimming pool and bathhouse shall have been approved by the Committee and Township; and (iii) a temporary storage building for the storage of materials and supplies to be used in connection with the construction of a Dwelling on any Lot may be kept and maintained on such Lot during the period of such construction. SECTION 11. STORAGE OF VEHICLES. No house-trailer, commercial vehicle, truck, boat, boat trailer, snow mobile, camper, recreational vehicle or camping, horse or other utility trailer or vehicle (except passenger cars and passenger vans) may be parked or stored on any Lot unless stored fully enclosed within an attached garage otherwise constructed in accordance with this Declaration, except that (i) commercial trucks and vehicles may be parked upon any Lot while making deliveries or pickups in the normal course of business; (ii) one construction trailer may be kept and maintained within the Subdivision by each builder engaged in the construction of Dwellings within the Subdivision, provided that such construction trailer shall be located upon a Lot owned by such builder, or by the Person for whom such builder is constructing such Dwelling, and shall be removed from the Subdivision at such time as such builder shall have completed the construction of Dwellings within the Subdivision; and (iii) construction trailers used on a frequent and ongoing basis by the subcontractors of any such builder, provided that any such construction trailer shall be located upon a Lot owned by such builder, or by the Person for whom such builder is constructing such Dwelling, and each such construction trailer shall be removed from the Subdivision upon completion of the work of such subcontractor within the Subdivision. SECTION 12. ANTENNAS. No exterior radio, television or other communications antenna of any type, or any saucer, dish or similar device, may be erected, placed, maintained or permitted to remain on any Lot, except that the Committee may, upon appropriate application with regard to any Lot, determine that the absence of an outside antenna will cause a substantial hardship, and, upon such finding, may permit an outside antenna to be used in connection with such Lot under such conditions as the Committee shall deem reasonable. SECTION 13. UNSIGHTLY CONDITIONS. No Lot shall be used as a dumping ground for rubbish, trash, garbage or other waste, and such material shall not be kept or stored on any Lot except in appropriately sealed sanitary containers properly concealed from public view. Garbage containers shall not be left at the roadside of any occupied Lot for more than twenty four (24) hours during any one week. Any debris resulting from the destruction in whole or in part of any Dwelling, structure or improvement on any Lot shall be removed from such Lot by the Owner thereof with all reasonable dispatch. Each Owner shall prevent such Owner's Lot, and any Dwelling, appurtenant structure or other Improvement thereon from becoming unsightly or unkempt, or from falling into a state of disrepair. No laundry shall be hung for drying on any Lot outside of the Dwelling on such Lot. SECTION 14. EASEMENTS AND OTHER CONDITIONS. Easements for the construction, installation and maintenance of public utilities, for surface and road drainage facilities, and for sanitary sewer, storm sewer and water main facilities, are reserved as shown on the recorded Plat of the Subdivision, and/or as may otherwise appear of record, and as set forth herein. In addition, easements are hereby specifically reserved to the Declarant in, through and across a strip of land four feet (4') in width along all rear and side Lot lines for the installation and maintenance of telephone, electric and cable television lines and conduits, sanitary and storm sewers, water mains, and for surface drainage purposes, and for the use of any public utility service deemed necessary by the Declarant. The use of any such easement may be assigned by the Declarant, at any time, to any Person furnishing one or more of the foregoing services and/or facilities, and any such easement may be relinquished by the filing of record by the Declarant of an appropriate instrument of relinquishment. Within each of the foregoing easements, no structure, improvement, planting or other material shall be placed or permitted to remain which may damage or interfere with the installation and/or maintenance of such service facilities and utilities, or which may change, obstruct or retard the flow or direction of water in and through drainage channels in the easements, nor, without the written consent of the Committee, shall any change be made in the finished grade of any Lot once established upon completion of construction of the Dwelling on such Lot. The easement area of such Lot shall be maintained in a presentable condition continuously by the Owner, and the Owner of each Lot shall be liable for all damage to service facilities and utilities thereon, including, without limitation, damage to electric, telephone, natural gas, and cable television distribution lines and facilities located therein. No shrubs or foliage shall be permitted or maintained on any Lot within five feet (5') of any utility company transformer enclosure or secondary connection pedestal. The Roadways shall be used by each Owner and Occupant only for the Permitted Purposes, and in accordance with the Reciprocal Roadway Easement and Underlying Roadway Easements and no Owner or Occupant shall permit the Roadways to be used for any purpose inconsistent with the Reciprocal Roadway Easement or any Underlying Roadway Easement. Declarant hereby reserves the right (which may be delegated and assigned to the Association) to impress the Roadway Areas with additional easements for Common Utility Systems. SECTION 15. UNDERGROUND UTILITIES. All public utilities such as water mains, sanitary sewers, storm sewers, and electric, natural gas, cable television and telephone local subdivision distribution lines, and all connections to such facilities, either private or otherwise, shall be installed underground; provided, however, that (i) above ground transformers, pedestals, and other above ground electric, cable television, natural gas or telephone equipment deemed necessary by the supplier of any such utility service in connection with underground distribution systems; (ii) open drainage channels; and (iii) street lighting stanchions, shall be permitted. Each Owner shall be responsible for the installation, maintenance, repair and replacement of electrical, natural gas, telephone and cable television service conductors and facilities on such Owner's Lot, extending from the adjacent Roadway, or utility easement on such Lot, to the Dwelling. The Lots may be subject to charge, from time to time, for street lighting facilities installed and/or to be installed by The Detroit Edison Company pursuant to the request of the Township. SECTION 16. WEAPONS. No Owner shall use or discharge, or permit or suffer any member of his family, or guest or invitee, to use or discharge within the Subdivision, and B-B gun, firearm, pellet gun, sling shot, archery equipment or other weapon. SECTION 17. SIGHT LINES. No wall, hedge or shrub planting which obstructs sight lines at elevations between two feet (2') and six feet (6') above the Roadways shall be placed or permitted to remain on any Lot within the triangular area formed by the Roadway Area property lines and a line connected them at points twenty five feet (25') form the intersection of the Roadway Area lines, or, in the case of a rounded property corner, from the intersection of the Roadway Area property lines extended. The same sight lines limitations shall apply on any Lot within ten feet (10') from the intersection of the Roadway Area property line with the edge of a driveway pavement. No tree shall remain within such distances of such intersections unless the foliage line thereof is maintained at sufficient height to prevent obstruction of such sight lines. SECTION 18. AIR CONDITIONERS. No external air conditioning unit shall be placed in or attached to a window or wall of any Dwelling or appurtenant structure. Without the consent of the Committee, no compressor or other component of a central air conditioning system (or similar system, such as a heat pump) shall be visible from any adjacent Roadway, and, to the extent reasonably possible, all such external equipment shall be so located on any Lot so as to minimize the negative impact thereof on any adjoining Lot, in terms of noise and appearance. In general, such equipment shall be located only in the rear yard, within five feet (5') of the rear wall of the Dwelling, and shall not project beyond the sidewall of the Dwelling so as to extend into the side yard. SECTION 19. DRIVEWAYS. All driveways and driveway approaches shall be paved with an approved concrete surface, and shall be completed prior to occupancy of the Dwelling to be served by such driveway, except to the extent delayed or prohibited by strikes or adverse weather conditions, in which event, such paving shall be completed within sixty (60) days after the termination of such strike or adverse weather conditions. SECTION 20. SALES OFFICES. Anything in this Declaration to the contrary notwithstanding, Declarant, and the successors and/or assigns of Declarant (including, for such purpose, any builder to whom Declarant shall have sold Lots within the Subdivision), and its or their agents, employees and sales representatives, may use and occupy any Lot or Dwelling in the Subdivision for model or display purposes and/or as a sales office in regard to the sale of Lots or Dwellings therein or other lands in the Township owned by the Declarant, until all of the Lots and Dwellings to be built on the Lots, or such other lands, shall have been sold. SECTION 21. SIGNS. No sign of any kind shall be displayed to the public view on any Lot, except (i) one sign of not more than five (5) square feet (the top of which shall be not more than five (5) feet above the ground) advertising the Lot for sale; (ii) uniform street address signs, of the type and in a uniform location specified by the Declarant; and (iii) signs of any size used by Declarant, or any builder in the Subdivision, to advertise the Lots (and/or new Dwellings thereon) for sale, during the construction and sale period. SECTION 22. LANDSCAPING. Each Lot must be landscaped in accordance with the approved landscaping plan for such Lot within ninety (90) days after initial occupancy of the Dwelling, weather conditions permitting, or within ninety (90) days after the end of such adverse weather conditions. After landscaping has been installed, the relevant Owner shall maintain such landscaping in good condition, consistent with the approved landscaping plan. SECTION 23. PROHIBITED VEHICLES. No snowmobiles or other vehicles designed primarily for off-road use, except golf carts, shall be operated within the Subdivision. SECTION 24. DISPOSALS. All Dwellings within the Subdivision shall be equipped with an electric garbage disposal unit in the kitchen. SECTION 25. BACKBOARDS. No basketball backboard or hoop may be placed or installed on ay Lot as to be visible from the Roadway on which such Lot fronts, and, in the case of a corner Lot, from the side Roadway, as well, provided, however, that one basketball backboard per Lot, together with a connected hoop and/or structural pole, may be installed on any Lot if such backboard is predominately clear and transparent. SECTION 26. WELLS. No Owner shall dig, or attempt to dig, any well on any Lot. SECTION 27. LEASES. No Owner or Occupant shall lease and/or sublet less than the whole of any Dwelling on any Lot. SECTION 28. SIDEWALKS. Public sidewalks adjacent to the Lots shall be four (4) feet in width, and shall be constructed of concrete. SECTION 29. GRADE CHANGES. The grade of any Lot, once established upon the completion of the Dwelling upon such Lot, may not be changed without the written consent of the Township and the Committee. This provision is intended to prevent interference with the drainage plan for the Subdivision. SECTION 30. UNAUTHORIZED USE OF GOLF COURSE. No Owner or Occupant shall be permitted to enter upon the Golf Course, or upon any appurtenant golf cart path, without payment to the Township of the requisite greens fee for such use, nor shall any use within the Subdivision be permitted to encroach upon the Golf Course. SECTION 31. RETRIEVAL OF GOLF BALLS. Declarant reserves the right to impress each of the Lots abutting the Golf Course with an easement permitting golfers to retrieve errantly hit golf balls from such Lot; provided that (i) the area of each such Lot beyond the common line between such Lot and the Golf Course shall have been clearly marked "out-of-bounds", in the usual manner, by the Township; (ii) such retrieval shall, in each instance, be on foot by such golfer, never by golf cart; and (iii) the rules of play of the Golf Course shall incorporate (ii) above, and shall, in addition, expressly prohibit the hitting of any shot from and such Lot. SECTION 1. ENFORCEMENT. The Association or any Owner shall have the right to enforce these covenants and restrictions by any proceeding at law or in equity against any Person violating or attempting to violate any covenant or restriction, either to restrain violation or to recover damages, and against any Lot to enforce the lien created by these covenants upon such Lot; and failure by the Association or any Owner to enforce any covenant or restriction herein contained shall in no event be deemed a waiver of the right to do so thereafter. SECTION 2. SEVERABILITY. Invalidation of any one or more of these covenants or restrictions by judgment or court order shall in no way effect any other provision of this Declaration, and this Declaration shall otherwise continue and remain in full force and effect. SECTION 3. NOTICES. Any notice required to be sent to any Member or Owner under the provisions of this Declaration shall be deemed to have been properly sent when mailed, postage prepaid, to the last known address of the Person who or which appears as Owner on the records of the Association at the time of such mailing. SECTION 4. ANNEXATION OF ADDITIONAL LANDS. Additional subdivisions of land, now or hereafter owned by Declarant, or any affiliate of Declarant, and locate within the area bounded by Canton Center Road, Ridge Road, Cherry Hill Road and Palmer Road (in each case, an "Addition"), may be brought by the Declarant under and within the jurisdiction of the Association (without the consent or approval of the Association or any Owner), in each case, by means of a Supplemental Declaration of Covenants and Restrictions filed of record with regard to such Addition, which shall extend to such Addition the scheme of the covenants and restrictions contained in this Declaration, and which shall subject the lots therein to assessment (and shall extend membership in the Association to such owners) on the basis set forth herein, and which shall provide that any additional park areas therein shall be for the use and benefit the Owners, the residents in such Addition, and the residents in any subsequent Addition. Any such Addition may or may not contain additional park areas. Nothing contained herein shall require the Declarant to make any Addition to the Association. Any annexation of additional land by action of the Association (other than as aforesaid) shall require the consent of two-thirds of the Owners. SECTION 5. TRANSFER OF RIGHTS AND POWERS. Declarant hereby reserved the unequivocal right to assign to the Association, in whole or in part, from time to time, any or all of the rights, powers, titles, easements and estates reserved by, or given to, the Declarant hereunder, including, without limitation, any right or power to approve or disapprove any use, act, proposed action or other matter or thing. Any such transfer or assignment shall be made by appropriate written instrument, recorded among the records of the Wayne County Register of Deeds, and such assignee shall thereupon have the same rights and powers, and be subject to the same obligations and duties as herein given and reserved to and assumed by Declarant in connection with the rights, powers and easements so assigned, and such instrument, when executed by such assignee, shall, without further act, release the Declarant from all obligation, duty and liability in connection therewith. SECTION 6. AMENDMENT AND DURATION. This Declaration, and the covenants and restrictions herein contained, shall run with and bind the Lots, Common Areas and Roadways, and shall insure to the benefit of, and be enforceable by the Association, or any Owner, their respective legal representatives, heirs, successors and/or assigns, for a term of thirty (30) years from the date this Declaration is recorded (the "Primary Term"), after which time this Declaration shall be automatically extended for successive periods of ten (10) years, unless an instrument signed by the then Owners of two-thirds of the Lots shall have been recorded, agreeing to change this Declaration, in whole or in part; provided, however, that no such agreement and instrument of change shall be effective unless made and recorded at least three (3) years in advance of the effective date of such change, and unless written notice of the proposed agreement and instrument of change is sent to every Owner at least ninety (90) days in advance of any action taken; and, provided, further, that no such agreement and instrument of change affecting the Common Areas or Roadways, in any way, shall be effective unless the prior consent of the Township shall have first been obtained. This Declaration may be amended during the Primary Term by a recorded agreement and instrument of change signed by not less than eighty percent (80%) of the Owners; provided, that until January 1, 1997, Declarant shall have the right, by written instrument, signed, acknowledged and recorded with the Wayne County Register of Deeds, to modify, amen, restate, waive or repeal any or all of the provisions herein contained with respect to any thing, or any particular Lot within the Subdivision. Any such modification, amendment, restatement, waiver or repeal, may be made retroactive to the date of recordation of this Declaration. IN WITNESS WHEREOF, Declarant has caused this Declaration to be executed as at the date first above set forth. The within instrument was acknowledged before me this 7th day of June, 1994, by Richard M. Lewiston, who is a Managing Partner in GLENGARRY DEVELOPMENT ASSOCIATES, a Michigan general partnership, which is the Managing Partner in ISLAND LAKE ASSOCIATES, a Michigan general partnership (the "Partnership"), on behalf of the Partnership. I, Sandra Fercho, acting as Recording Secretary for the Association retyped this Declaration in its entirety for the sole purpose of publishing Declaration on Association Website for all Owners and Occupants to view.